In the past I along with hundreds of thousands if not millions of other Colorado citizens worked to preserve our wonderful Colorado caucus-assembly system. Every two years it gives us a chance for a statewide civics lesson. This will be made much more difficult if the date is moved up to the beginning of February, and almost impossible if the two major political parties choose different dates, which the draft bill on your desk now would allow. 1376 was pushed through at the end of the session, and there was not adequate time to reflect on the consequences. In my opinion, it will be the final nail in the coffin of our wonderful Colorado neighborhood caucus-assembly system for nominating to the primary ballot. We'll have become like California where candidates just pass petitions, run ads, and never have to shake hands with the voter to get elected. 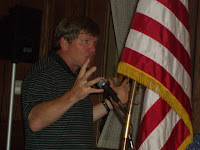 This will have a dramatic negative effect on the health of our neighborhoods over time. 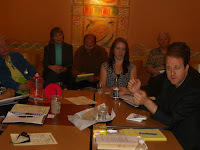 Your support of Colorado grassroots now will make a critical difference. Please veto HB1376. He told us he did no market research and no formal planning before launching his business selling flowers directly from the grower to the consumer. 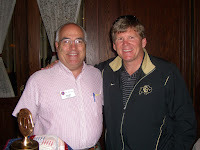 The new University of Colorado football coach Dan Hawkins (top pictures, the guy with hair) told our Denver Lions Club yesterday that he expects the Buffs to fare much better next year. "Coaching became much more enjoyable to me over 20 years ago, and I started building winning teams, when I started focusing on what I can do for the players to make a positive contribution to their lives. It's not just about beating Nebraska and Colorado State. Although if we don't beat them next year you'll probably have a different speaker here with you!" He admires Ghandi and Mother Terresa, he thinks everyone involved in leadership and team building should read Phil Jackson's book Sacred Hoops.